US NavySailors watch the aircraft carrier USS John C. Stennis sail alongside the aircraft carrier USS Ronald Reagan, May 5, 2015. 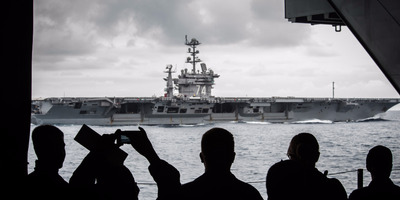 Earlier this year, Defence Secretary Jim Mattis outlined a change to the Navy’s approach to aircraft carrier deployments, mixing up when carriers leave and return to port, shortening their time at sea, and adding flexibility to where they go and what they do. The change is meant to lessen the strain on the fleet and its personnel while keeping potential rivals in the dark about carrier movements. This “dynamic force employment” was underscored by the USS Harry S. Truman’s return to Norfolk, Virginia, after a 90-day stint at sea that did not include the traditional trip to the Middle East to support US Central Command operations. Amid that ongoing shift, the Navy is shuffling the homeport assignments for some of its carriers, as it works to keep the fleet’s centerpieces fit for a potential great-power fight. Carrier refuelings are scheduled long in advance to ensure they’re able to remain in service for a half-century, despite heavy operational demands. The carrier fleet is a crucial piece of US strategy, which in 2018 assessed strategic rivalry from China and Russia as the country’s foremost threat. 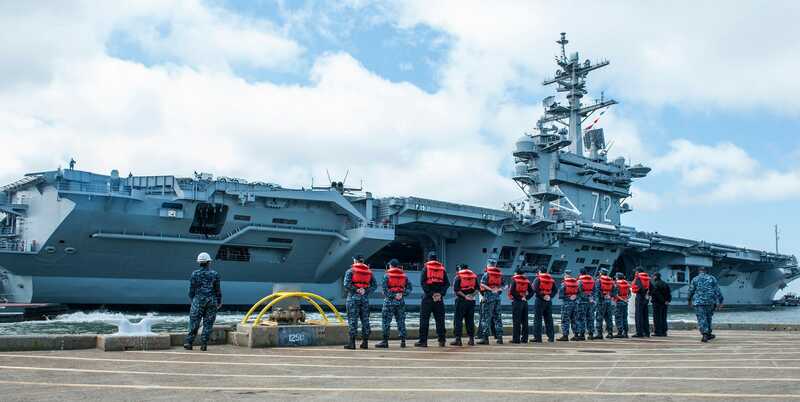 Three of the Navy’s 11 active carriers – Nimitz-class carriers USS Carl Vinson, USS Abraham Lincoln, and USS John C. Stennis – will get new homes. The USS Abraham Lincoln, which is currently homeported in Norfolk, Virginia, will move to San Diego and rejoin the Pacific fleet. The Lincoln joined the fleet in 1989 and was part of the Pacific fleet from 1990 to 2011. It moved to Norfolk from Everett, Washington, in 2011 for midlife refuelling, known as reactor complex overhaul, which wrapped up in mid-2017. US Navy/Mass Communication Specialist Seaman Jennifer M. KirkmanSailors prepare to moor USS Abraham Lincoln in Norfolk, Virginia, September 7, 2017. 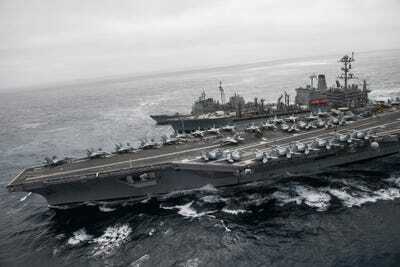 With the Lincoln back on the West Coast and the Stennis and Vinson heading east, the Navy will still have five of its 10 Nimitz-class nuclear-powered carriers assigned to the Pacific Fleet. 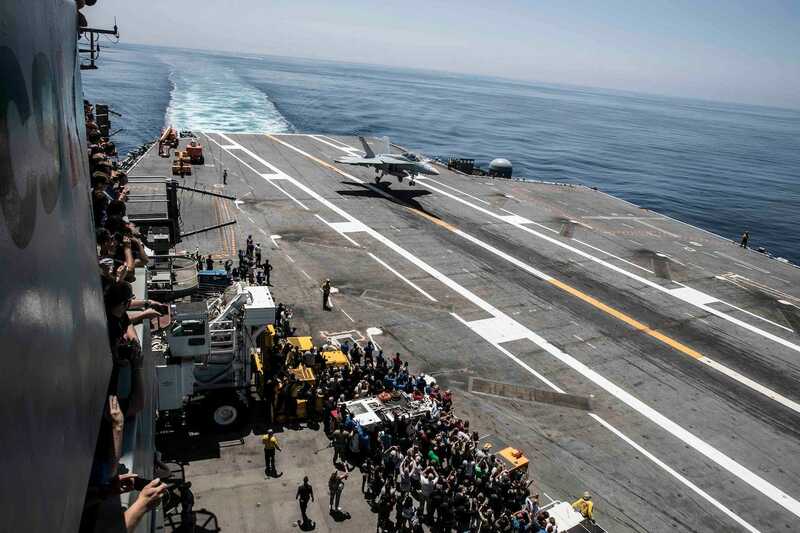 US Navy/Mass Comm Spec 2nd Class Jacques-Laurent Jean-GillesGuests watch as an F/A-18E Super Hornet performs a touch-and-go-landing aboard the Lincoln during an air-power demonstration, June 30, 2018. The USS John C. Stennis will move from its current homeport at Naval Base Kitsap in Bremerton, Washington, to Norfolk, where it will undergo midlife refuelling. US Navy/Mass Comm Spec 2nd Class David A. BrandenburgAn F/A-18E Super Hornet prepares to take off from the Stennis on May 10, 2018. The Stennis entered service in 1995. Nimitz-class carriers have a service life of 50 years, but they must relocate to Newport News in Virginia to get the reactor refuelling, as that is the only facility that can carry it out. 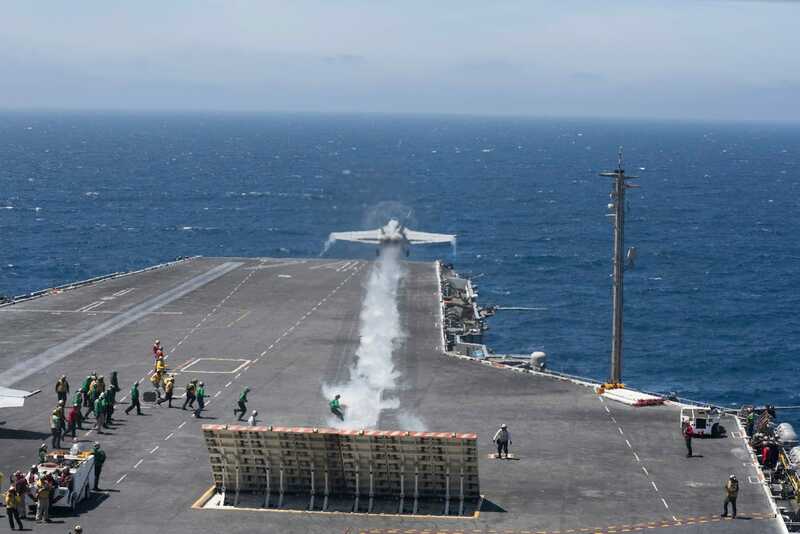 US Navy/Mass Comm Spec Seaman Angelina GrimsleyAn F/A-18E Super Hornet takes off from the aircraft carrier USS John C. Stennis, May 5, 2018. 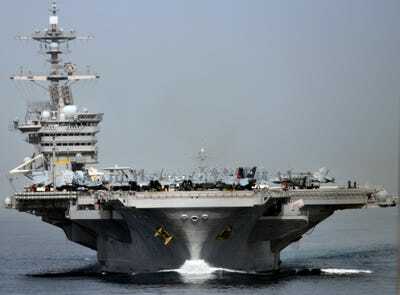 The Stennis has been stationed at Kitsap since 2005, when it relocated from San Diego. 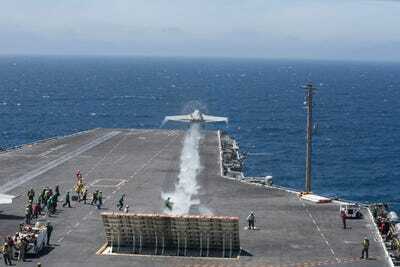 The carrier left port without notice at the end of July and will conduct training exercises while underway. It’s expected to deploy later this year, though the Navy has not said when it will leave or how long it will be gone. The USS Carl Vinson will stay on the West Coast, moving from Naval Air Station North Island in San Diego to Kitsap in Washington. The ship has been stationed at North Island since 2010. US Navy/Mass Communication Specialist 3rd Class John GrandinThe Vinson transits the Strait of Hormuz. The Vinson, which was commissioned in 1982, will move north ahead of its planned incremental maintenance at the Puget Sound Naval Shipyard. US Navy photo by Mass Communication Specialist 2nd Class Sean M. CastellanoThe Vinson transits the Sunda Strait, April 15, 2017. 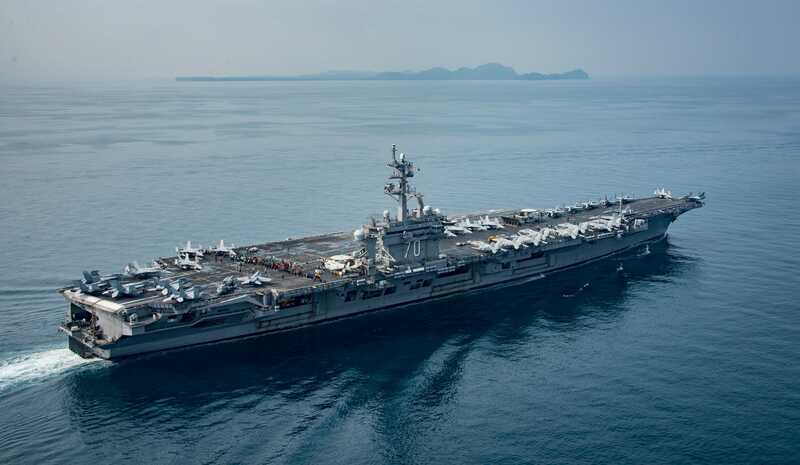 The Vinson finished at three-month deployment in the western Pacific in April — a trip that included the first visit by a US aircraft carrier to Vietnam since the end of the Vietnam War. More recently, the Vinson took part in the multinational Rim of the Pacific exercises off Hawaii.